Still making progress here. Most of the crumb blocks are still sort of unfinished and will be added to with this last pile of strips. I'm definitely feeling better about starting this whole project. Now, I'm thinking this may actually be doable. I really want to put together at least one small top so that I can feel a sense of accomplishment. 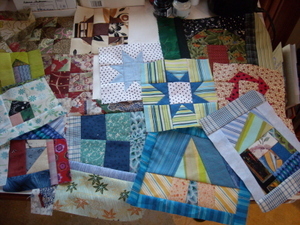 To that end, I started sorting some of the blocks as you see here (light colors, blues & greens, reds and browns, mixed and the smallest pile so far- night at the improv). These will probably go through more rearrangement as we go along, but it gives me something to go on for now. My book pile is now topped with Gwen Marston's Liberated Quiltmaking and Liberated String Quilts. Both are so inspiring right now. 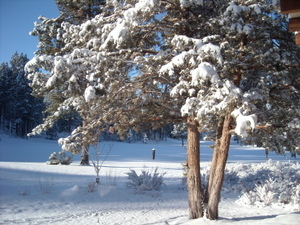 I can't wait to get far enough along here to try laying them out for a quilt. I've got some more sewing to do before then though. 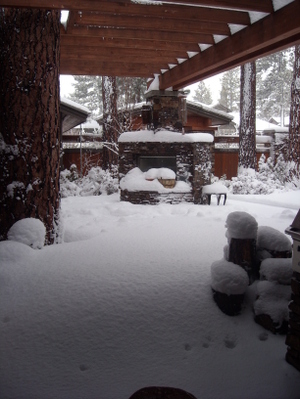 As a bit of distraction, this is what it looked like here today. 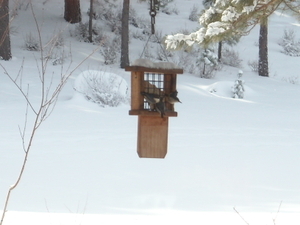 We've been having daily visits to the peanut and suet feeders by the pygmy nuthatches and chickadees. I just love these little guys! See that basket above with the crazy open handle? I think I'm going to leave it that way. I just keep making more of these and throwing them on the pile. 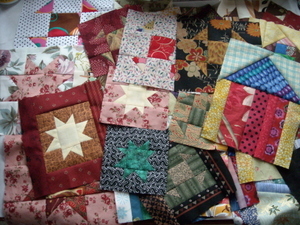 I'm already dreaming up names for the quilts that I might make from these. How do you like "Night at the Improv"? And still the strips are piled high. Send more chocolate! Just kidding. 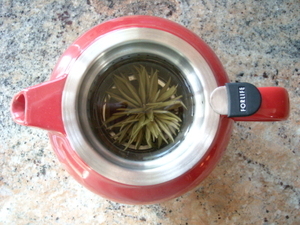 I'm getting by on green tea with jasmine right now. Mmmmm. Scrap frenzy continues apace here. Above are the partially completed crumb blocks. I still haven't decided on a block size (or whether I'll just put all the sizes together randomly). Below are some of the liberated blocks I made. You can see houses, stars, churn dash, four patch, broken dishes, shoo fly and a tree. There'll be more of these because they are so much fun to make. 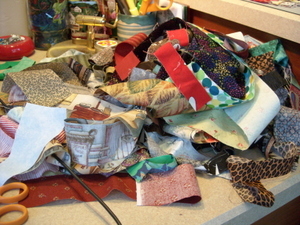 It's been a little overwhelming to have so many scraps. If there's one thing I've learned over the past week it's to not let your scrap bin get so out of hand. When I sorted the scraps I took out a whole shoe box worth of bright scraps and kid prints and I have to congratulate myself for deciding to give them away. It was sort of hard to do, but a relief in the end. I offered them last night at my homeschooling group's Mom's Night Out and they were gladly taken. Whew! However, there are still more I want to use up! There's even another stash of long strips in the closet that will fit color-wise with these. This is going to be a long process! 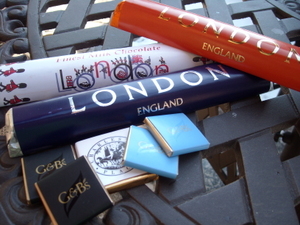 It's a very lucky thing, then, that Mark brought home a stash of chocolate from London. I think I might just have the energy for this with enough chocolate! I finally got to blocking Argosy last night. 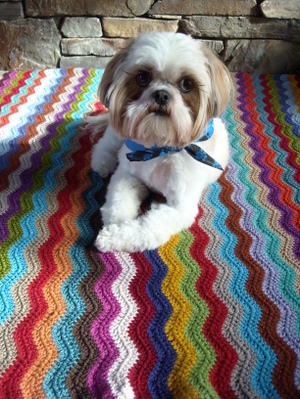 What a wonderful knit. I enjoyed the pattern once I got used to it. Actually a few weeks ago I lost the pattern and had to print it off again. I found that knitting charts had been added and it was significantly easier to remember the pattern once I had seen it written out in chart form. This wrap is long! It's 105" by 15". If I were to make it again I think I would make it wider and shorter. The story of how I started this wrap is here. 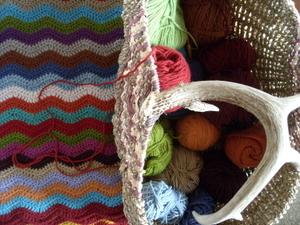 This is Noro Silk Garden. I don't think I have the colorway information anymore. I didn't pay any attention to the way the striping went. When I came to the end of a ball, I just started another one randomly. So, another big finished object! I'm making progress here. The scrap blocks are coming along. I can't believe how much time it's taken. I only started last weekend, but I still have strips that haven't been incorporated. 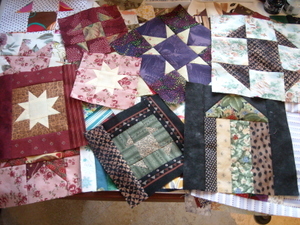 I think by the time I'm done I'll have several quilts out of these! They'll probably be wall sized or smaller, but still... I have noticed that I tend to make certain blocks have a color theme, so I think I'll divide them up along color themes somehow. Also, I got tired of making just crumb style blocks and ended up doing some liberated blocks according to Gwen Marston and Freddy Moran's Collaborative Quilting. That was lots of fun. Photos to come soon! I sat down to work on the Santa embroidery for Better Not Pout yesterday and realized I need some tracing paper to transfer the design. I knew I used to have some and couldn't find it. Okay, silly me, just as I was typing that I remembered where it is! I'll get back to that this week! Anyway, I got inspired by a link to Bonnie's Crumbie Quilts from Lazy Gal Tonya. I really love the one that Bonnie did with the cheddar border. 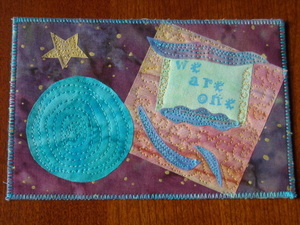 That's what I'm picturing this quilt to have eventually, though I do plan to audition colors when the blocks are done. These crumb blocks are so fun to do. 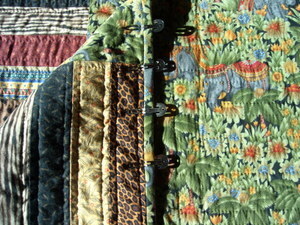 Just sew and trim, sew and trim, ad infinitum! I really have no idea how many blocks this bunch will make, but I think there will be quite a few. 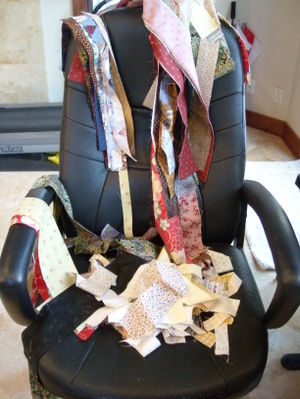 The photo above shows only a small portion of the scraps I'm using right now. 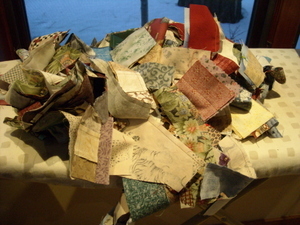 The scraps I'm using now are only about half of what I have all together because I sorted them yesterday as well. I ended up doing a pile of reds, blues, greens and neutrals with some yellows and golds thrown in. The other piles were the brights which include all those colors plus purples- all the really, really bright stuff. There are some brights in the first pile too, but the majority of them went in the second pile. I also separated out the batiks. 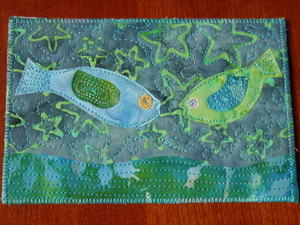 I always seem to feel that batiks look good together no matter the colors, so I kept them together. There's a much smaller pile of them, so I'm not sure what I'll do with them someday. By the way, this is not all the scraps I have. This is most of the small stuff, but I have sets of long strips also separated by color. I pieced together the pinks, greens and purples that I showed you here. I have yet to machine quilt those. 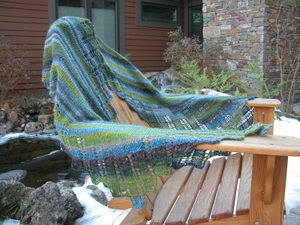 I also have piles of blues and greens and a set with similar colors to those seen above. I also have a bunch of stuff in my scrap drawer that needs going through. 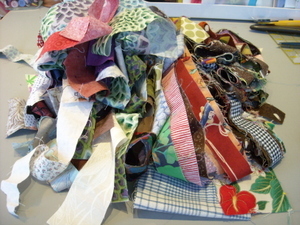 I know there's a bag of Kaffe Fassett print scraps and there's a bag of solid scraps. 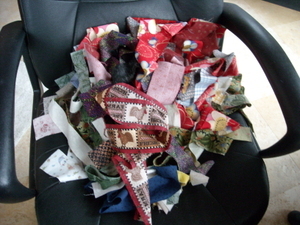 Chloe also has a bag of scraps she bought once at a quilt shop that I need to go through (she said I could have it!). Oh my, so many scraps of life. It's cool how each fabric brings to mind the project it was originally used for. 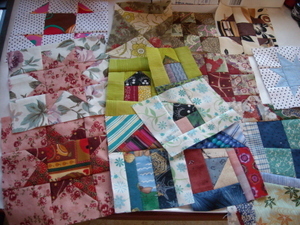 For instance, those two on the top of the pile in the last photo went into Hana's Quilt. I can't wait to see how this new crumb quilt looks in the end! 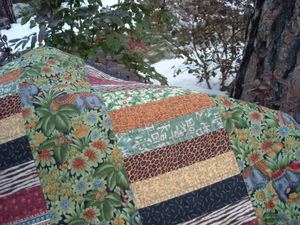 The story with this quilt is that I started it during our year in Hawaii. It was intended to go with our lovely green sofa we had there. That sofa was sold when we moved back to the mainland, but the quilt will look great on our current lovely brown sofa! 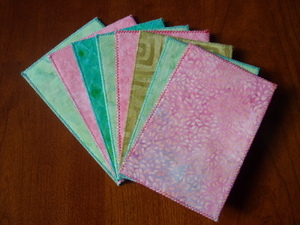 I bought these fabrics from Keepsake Quilting way back in 2002. I saw these fabrics sold as one of their medleys and knew I had to get them. I don't recall if I added anything extra to the set they sold together. 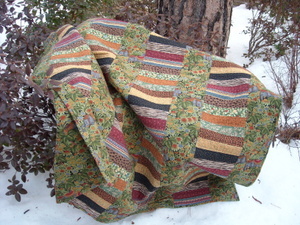 Anyway, the good news is that I still love these fabrics and the simple nature of the quilt. 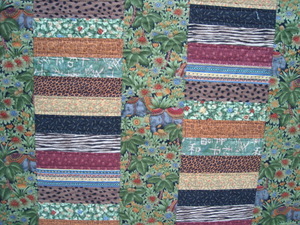 I decided to hand quilt the coins with an outline, then decided to quilt around the elephants and palm trees in the strips. 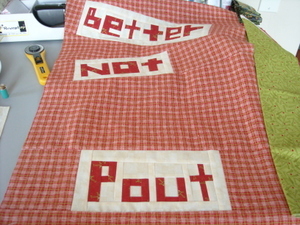 This turned out to be rather tedious and is the reason the quilt languished in the cupboard for far too long. I'm so glad it's done though because this looks great in the living room. I'm going to work on the appliqued Santa and see if I can get Ryan to draw me a Christmas tree for the left side. Meanwhile, my evening project is the binding on Elephant Walk. It's coming along nicely and should be done in the next day or two. 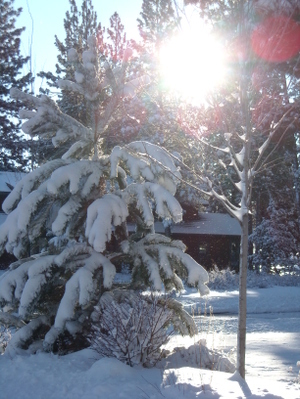 We are finally having some sun after a week of lots of snow, then rain. Yesterday we drove about 15 miles up toward Mt. 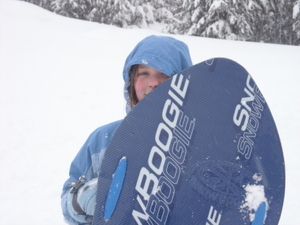 Bachelor for a sledding day at the new Wanoga snow play area. What a blast! I even went down several times. I was so exhausted last evening, but it was worth it. 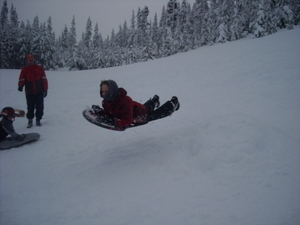 Ryan flying over the jump! 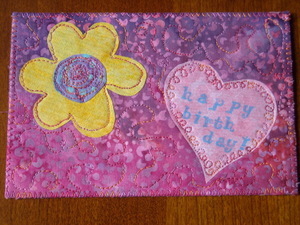 I've spent a few hours over the last several days making fabric postcards and, boy, has it been fun! 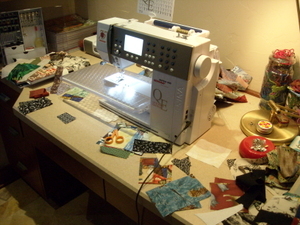 It's like making ATC's which I can do for hours as well. I guess it's also like potato chips. You can't stop at just one! I'm making them the same way as I mentioned in the tutorial I did last year, with a couple of changes. First off I gave the Steam-a-Seam 2 a try and love it. 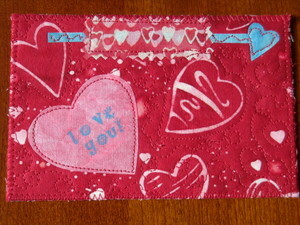 It's a double sided fusible web that comes with paper on both sides. It's a bit tacky so that you can position things and not have them fall off while you move things around or carry it to the ironing board. It's way better than Wonder Under! 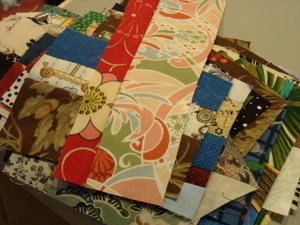 I ended up fusing 6" squares of the stuff to a bunch of different batik fabrics to use as my palette. Then I just cut and fuse like collage. Click any photo to see more closely. Second I also tried the Fast-2-Fuse for the interfacing and it's much better than the Pellon stuff as well. I'm so glad I asked at the quilt shops for recommendations. I ended up making 8 postcards, all from my batik stash. 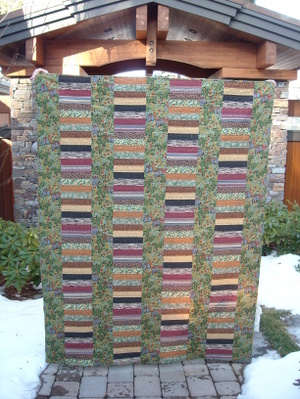 I love my batiks, but discovered a few years ago that I can't hand quilt through them, so almost stopped using them. I decided to reserve them for machine quilting, but these postcards are a perfect use of them. 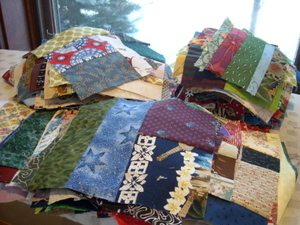 Actually, getting out all those gorgeous fabrics again makes me want to make a quilt with them! 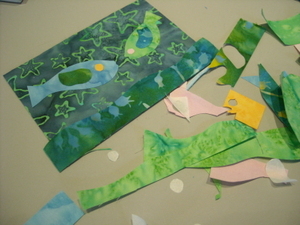 Anyway, the first seven were fused pieces on a single background fabric. This all started because I found out about the Global Art Project for Peace. 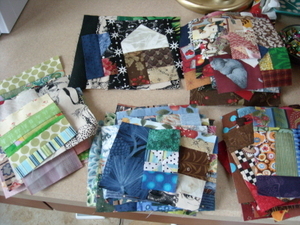 I thought I might make a mini quilt or postcard for the exchange. This one is a prototype, but the final piece may end up quite different. I mentioned in the last post that these postcards are for the Wish Upon a Card project for the Sisters Quilt Show this summer. Since the proceeds will be going to a breast cancer charity in my home town (the very place I will be receiving radiation treatments in a couple of weeks), I decided at least one card had to have a breast cancer theme. 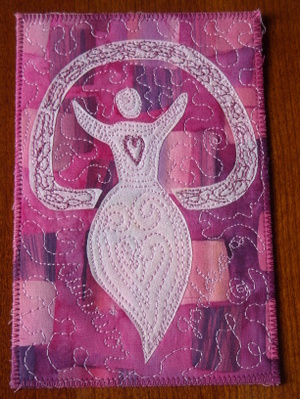 This one is Survivor Goddess and is based on the hand carved stamps I made for the Art for Cures breast cancer swap. This is the first time I've tried to write with free motion stitching. 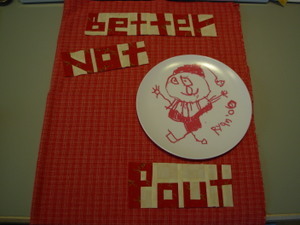 It was kind of fun, but there's room for improvement! 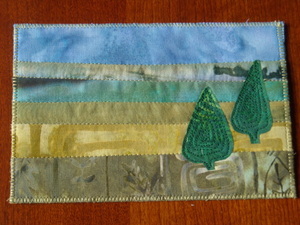 Luckily, these postcards are giving me lots of practice with the free motion quilting. I'm finishing up a couple of big projects now. 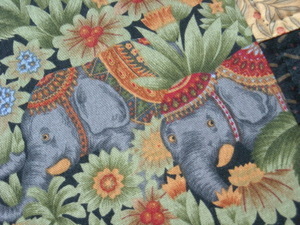 The Elephant Walk quilt from the last post just needs a binding! Yay! Also, I have finished all the knitting on my Manos blanket (bet you don't even remember that one!). 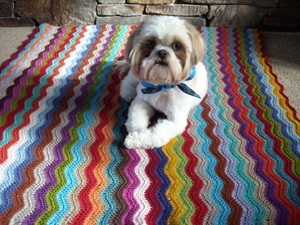 It needs seaming and a crochet edging. 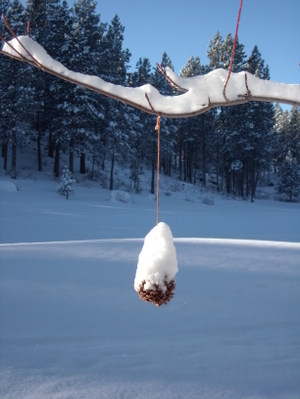 I don't know when I'll get to that, but hopefully sometime before winter ends. 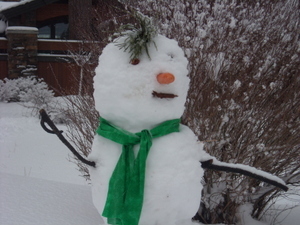 With the snow we've been having I think I have a bit of time! 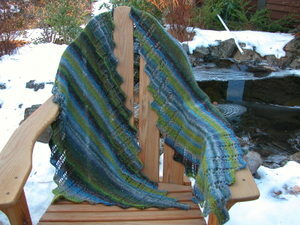 Today I finished all the knitting of the Argosy Wrap. I love this one! The colors are perfect and it's gorgeous. 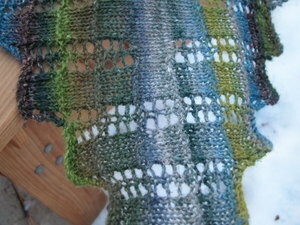 It needs the ends woven in and a good blocking. I'll post a photo as soon as it's dry. 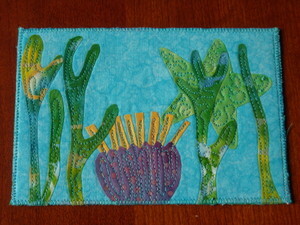 Oh, and a news flash- my sister will be visiting for the quilt show this year! I'm so excited. Sisters in Sisters- that's right! Okay, these are the last of the Santas (and elves and dwarves) for now! 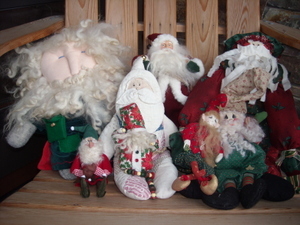 First are the soft Santas that I've collected over the years. 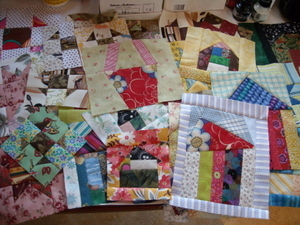 I made the three on the right, but I think my favorite is the white one in the middle made from an old quilt. This is my whole collection of these cross stitch Santa kits. These are all done on perforated paper. 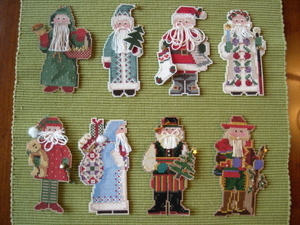 These appear to have been distributed by Yarn Tree, but the bottom two on the right were designed by Sandra Cozzolino for the first Olde Time Santa Ornament series. There have been several more series since then and I guess that's where the rest came from. 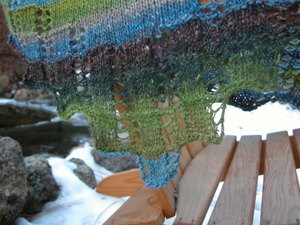 All the other series were designed by Beth Johnson at Yarn Tree. I can't find any photos of the rest of them online. Sandy has continued to design similar Santa ornaments over the years and I was able to find a good collection of them from Mill Hill. There's even an ebay store for these, so if you're interested you might want to check out Beading Betty. I have to admit I'm seriously thinking about getting a few more of these kits. They're so darn cute! I almost forgot to show you our Christmas card this year. 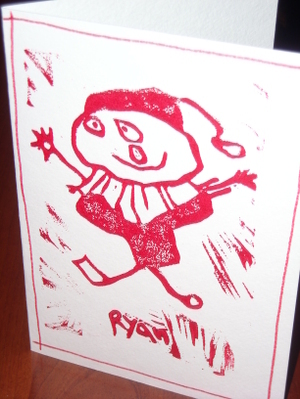 I think this is the first year I've used Ryan's art for it. He doesn't really do much art, so it's never come up before, but when I decided to use this plate design on a mini quilt (scroll down) for Ryan, this idea came to me as well. I transferred his design to some easy cut block and spent a rather long time carving. I was so pleased with these and I hope all who received them realize how rare they may be! One of my goals for these next few weeks will be to work on some of the large projects that have been sitting around for a while (sometimes a rather long while!). However, I had a post-holiday studio cleaning and couldn't help taking a look at a book that's fairly new, Art Quilt Workbook by Jane Davila and Elin Waterston. I've had it for a while, but have just now really read through it. There's so much in this one! I think it's really worth the price. I also just discovered that both artists have blogs. Check them out at will.love.logic and Chary Sprouts. 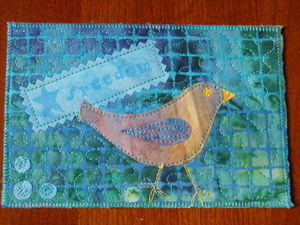 The book really energized me so I spent a little bit of time today playing around with batiks and I'm planning some fabric postcards for the Sisters Outdoor Quilt Show's Wish Upon a Card this summer. They will be collecting postcards to auction and sell for charity. Last year they had 500 postcards donated and raised $6000.00 for a local charity. This year they hope to get over 1000 postcards and will donate the money to Wendy's Wish Appeal, which is a charity in support of St. Charles Cancer Treatment Center. I'll be starting my radiation treatments there in a couple of weeks. 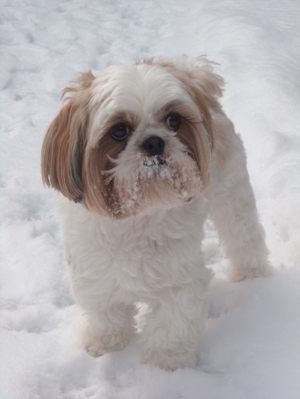 If any of you have a chance to make postcards for this very worthy charity it would be great! You can read my little tutorial from last year for some inspiration. 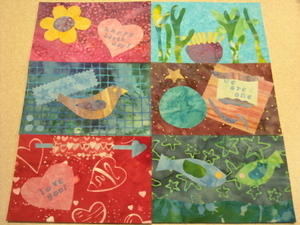 Speaking of the quilt show, if you are interested in entering the quilt block contest this year, the info can be found here. Well, that's it for now. I'll be back soon hopefully with some older finishes and some new inspiration!